With modern optics inside a robust package, the new Omano OM150-M LED student microscope is an ideal way to introduce young scientists to the world of microscopy. 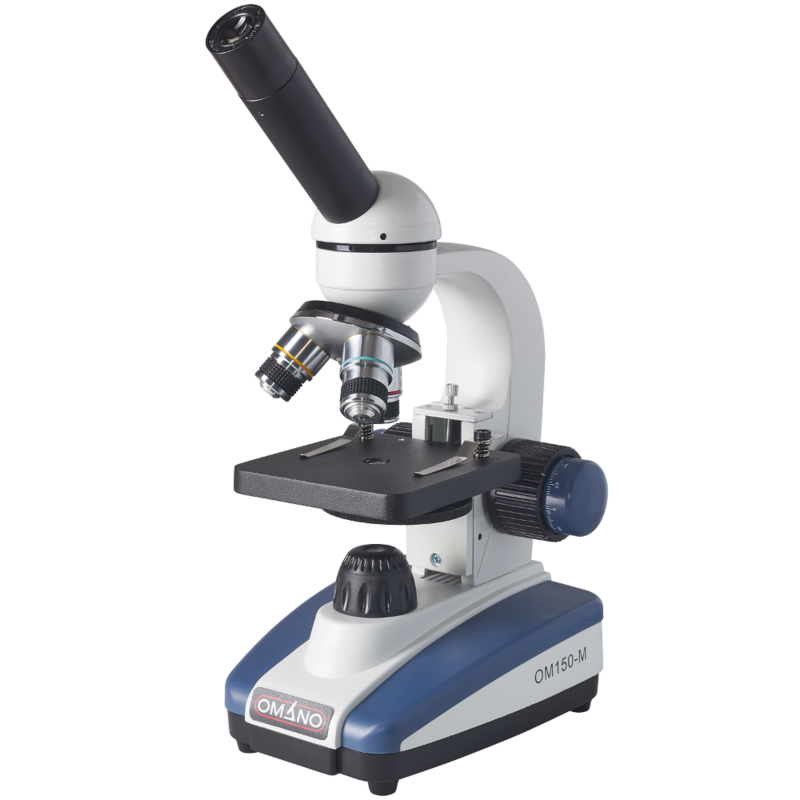 As the latest edition to the Omano Student Microscope line, the OM150-M features high quality optics made out of 100% optically coated glass to ensure a crisp and clear image. All-metal construction and worry-free battery-powered LED illumination in the OM150-M guarantees years of dependable performance in the classroom or at home with hobbyists. All-glass optics and variable-intensity cool LED illumination offer the magnification required for Elementary and Middle School students. A wide field WF10x eyepiece combines with three achromatic objective lenses, 4x, 10x and 40x to provide magnification of 40x, 100x and 400x. An eyepiece lock nut can be tightened to minimize the risk of loss and the head rotates through 360 degrees as required. A large, flat top 90mm x 90mm stage offers two slide clips to secure specimen slides. Rack and pinion focus includes coaxial coarse/fine controls that are dual-sided for convenience and sized for smaller hands. A rack stop and slip clutch offer protection against inadvertent damage to microscope objectives or slides. A six-position pinhole aperture provides for illumination control and the resolution (fine detail) produced is excellent. A filter holder is provided for optimal adjustments. LED llumination is provided by 3 AA batteries with variable light intensity. The LED system ensures a long battery life, making it ideal for those extended field trips. Includes dust cover, manual, 3 AA batteries. 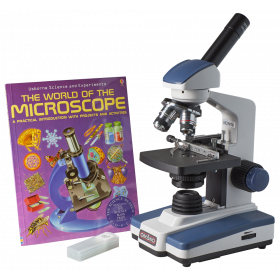 A step up from the OM-115LD, but still an entry-level microscope designed for elementary school children or beginners on a tight budget. 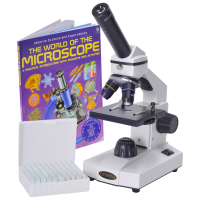 Recommended Kid's Microscope for elementary school and home use. 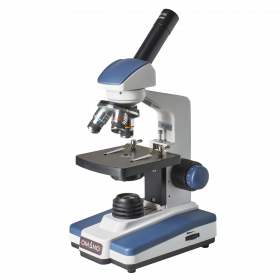 With modern optics inside a robust package, the new Omano OM150-M LED kid's microscope is an ideal way to introduce young scientists to the world of microscopy. 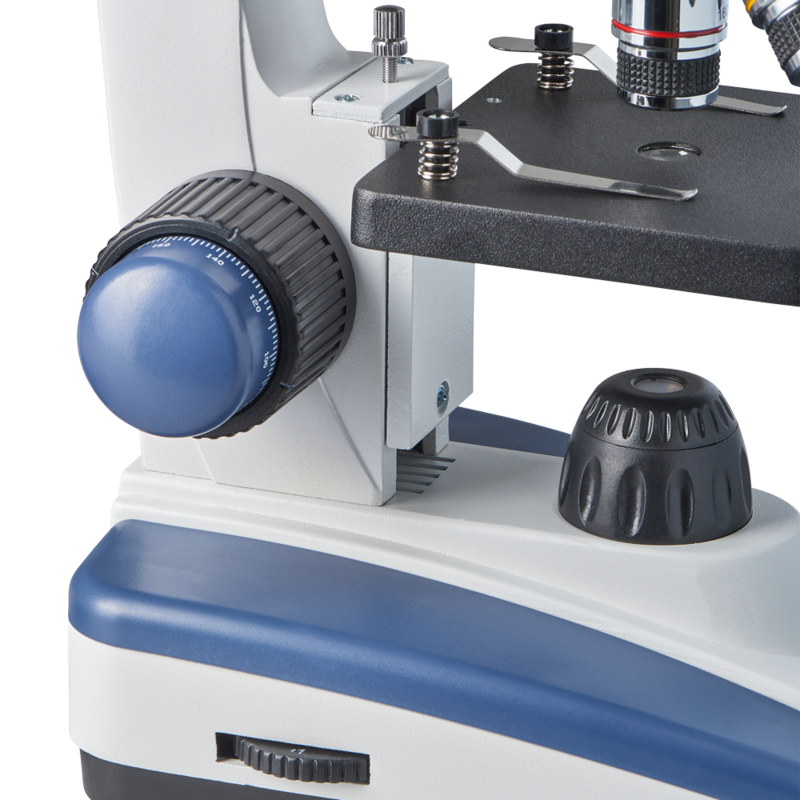 As the latest edition to the Omano Kid's Microscope line, the OM150-M features high quality optics made out of 100% optically coated glass to ensure a crisp and clear image. All-metal construction and worry-free battery-powered LED illumination in the OM150-M guarantees years of dependable performance in the classroom or at home with hobbyists.